Occasionally we will receive questions from users about the version of Revolution Slider that comes bundled with the theme. We’ve put this article together in hopes that it answers many of the most commonly asked questions by our users so that they can have a better understanding of how this version of Revolution Slider is supposed to work within the X and Pro ecosystem. The version of Revolution Slider that comes bundled with the theme a stock version of the plugin and does not feature any direct modifications to the way it functions. We have included some additional features, which can be utilized to enhance the way Revolution Slider operates and are available in the Slider Settings: Above Masthead and Slider Settings: Below Masthead meta boxes below the page editor in the WordPress admin panel. Release Cycles – While we try to include the latest version of Revolution Slider with each release, occasionally the release cycle of the plugin will prevent this from being possible. Essentially, since we have no idea when Revolution Slider will be releasing new versions of the plugin, we cannot plan our releases around this. 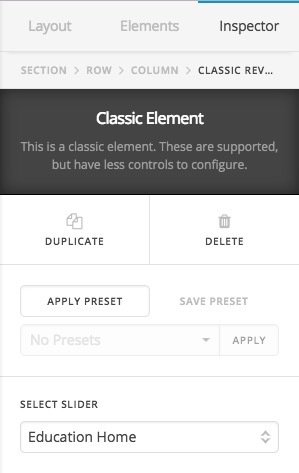 Because of this, if we have already begun the process of finalizing our release and submitting it to ThemeForest for review while Revolution Slider is putting out a new version of the plugin, that version of the plugin will not be able to make it into the theme until the next release at the earliest. Because of these reasons (among others), there is no need to register your license for Revolution Slider if you happen to have one. In fact, doing so is discouraged in order to prevent any potential conflicts when updating, as previously mentioned. If you happen to see a notification in your WordPress admin panel asking you to register Revolution Slider upon activation, simply dismiss this notice. Understanding certain features and how to utilize them is something that is very important if you hope to take full advantage of the Revolution Slider plugin. While we bundle the plugin with our theme and have used it in a selection of demos, it is recommended that you direct any questions you have about the plugin to the provided online documentation as it will more thoroughly address any matters you would like to know more about with the plugin. The version of Revolution slider included with the theme is an unmodified version of the plugin, but we have added some features of our own to the theme that work in conjunction with the plugin to enhance its functionality. 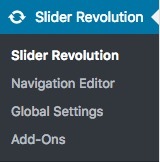 We do our best to ensure that the version of Revolution Slider included with X and Pro is as up-to-date as possible; however, this might not always be the case based on the reasons listed in the "Bundled Version" section above, which includes stability, release cycles, and the fact that not all updates are necessary. 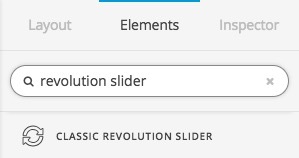 Any questions concerning the usage of a Revolution Slider feature should be directed to the online documentation referenced in the "Documentation" section above. Do we need to purchase Revolution Slider separately? Activate The revolution slider - How? Best slider with 3 visible slides? How to add content above header? How can I use a video as my header? How can I make text fly in from top of image? Changing background picture in GYM expanded demo? How to create slide show at top of the page? Is it possible to restructure the topbar/navbar so it is set within the page and stays fixed?